Yesterday, the Barton Football Academy hosted its final Elite Event of the year at Bellevue’s Interlake High School, and it did not disappoint. 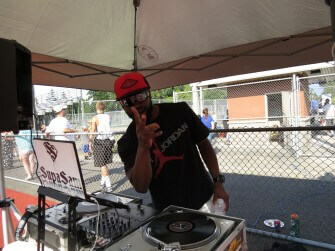 The atmosphere was competitive and electric thanks to DJ SupaSam who was on-hand to spin during the two-plus hour workout featuring some of the top athlete’s in the state. The QB group was by far the largest, and it was filled with talent there to work with BFA QB Coaches Taylor Barton and Alex Brink. Vancouver (Wash.) Union’s Nolan Henry, Sammamish (Wash.) Skyline’s Kilton Anderson, Chehalis (Wash.) W.F. West’s Tanner Gueller, Renton (Wash.) Hazen’s Nolan Hoover, Wenatchee (Wash.) QB Dillon Sugg, Spanaway (Wash.) Bethel’s Bryce Missey and Bothell (Wash.) youngster Devyn Rainbow were among the top performers of the day. Other QB’s who had really strong outings included Tyrell Shavers, a dual-threat QB from Seamount league-favorite Lindbergh, Jalen Goldsmith of Cascade Christian in Puyallup, Trevor Asbjornsen of Graham-Kapowsin, Rowan Parmenter (Cedar Park Christian) and Peninsula QB Robert Kvinsland. QB Jake Delozier of West Linn (Ore.) made the drive up for the event and performed well. There were even some youth QB’s that were in attendance, led by Ayden Ziomas. Plenty of skill players were present too, getting work in with WSU-greats Mike Bush (@MBush05 on twitter) and Greg Prater, and former OSU RB Ryan McCants. Auburn (Wash.) Riverside’s Drew Wallem continues to impress, along with Arlington WR Max Gray. Federal Way standout Keenan Curran, known mostly as a DB, spent the day at wideout, and Wenatchee’s Isaiah Brandt-Sims also got work at both the WR and RB spots. Brandt-Sims’ younger brother Christian also worked with the receivers, and looks to be as good as advertised. RB Russell Boston of Liberty was extremely impressive at the running back spot, and could have a huge year. Tristen Montgomery a RB from Kamiakin Middle School also looked solid, and is the younger brother of Juanita standout QB Tavin Montgomery. 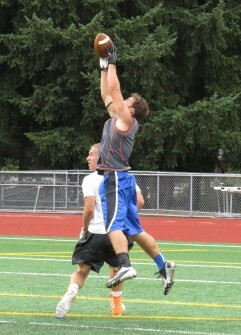 Michael Owes, a 2015 WR from O’Dea looks like a solid pass-catching threat when the Irish decide to air it out. Cooper Murphy (Olympia), Conner Longoria (Archbishop Murphy) and D’Angelo Faust (Lindbergh), Bryson Foster (Lakes) and Dashay Ware (Todd Beamer) some of the players who are two-way threats that looked strong on the day. A handful of young Skyline skill players – CJ Moore, Bradley Kim, Drew Kistner and Ben Mix – were present and look to continue the tradition at the 4A power. Graham-Kapowsin came with a mini-group of its own at the DB spot, with Jordan Sumerlin, Curtis Russel and Uri Nnoli all competing well. 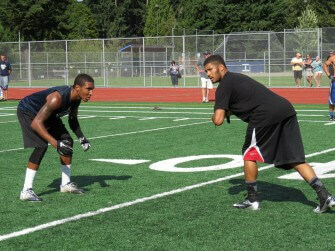 Former Portland State Viking Dionte Brooks coached a talented LB group that saw Aberdeen 2016 LB Joel Dublanko and 2015 LB Braiden Beckman Kentridge standout. Bellevue Christian DE/OLB/TE Tate Razor continues to look like one of the most gifted pass-rushers in the state, regardless of division – he also got some work in at TE as well. Another TE that got work at multiple spots (OL and TE) was W.F. West’s Bowe McKay, who has continued to show growth as a blocker and pass-catcher and could be in for a big senior season. Ryan Clary, an offensive lineman from Inglemoor was also in attendance to work with for OSU/Chicago Bear OL Alex Linnenkohl and also continues to show great potential. One of the fun things about Barton Football events is that the region’s top talent always seems to make it out even if they aren’t able to participate, and Sunday was no different. Budda Baker and Marcus Griffin, the nationally ranked duo from Bellevue both came out to catch the action, as did RB/Slot Cole Stephens of Lakeside School. Scout.com’s Brandon Huffman, Scott Eklund and Marshall Cherrington of Dawgman.com and Braulio Perez Cougfan.com were also on-hand to cover the event, a testament to the level of talent that competed. Overall, the entire event and BBQ that followed was a great way to end the offseason and set the tone for players as they get ready to start fall camp at their individual high school programs. We look forward to seeing lots of football this upcoming fall as the Northwest continues churn out top talent.